As can be seen from the few previous posts on this blog, one of our main focus at the moment is, in addition to trying to handle with all the data that we still have to process, to develop applications that demonstrate the benefit and the potential of linked data. When we obtained data from our estate department regarding the buildings and spaces in the Open University’s main campus (in Milton Keynes) and in the 13 regional centers, we got quite excited. The data contain details of the buildings and surroundings of the buildings (car parks, etc.) with their addresses, floors, spaces, images, etc. We therefore decided to build an application to not only use these data, but also create some of these missing relations, and specially, to allow OU users to connect to the data. The application is called wayOU, for “where are you in the OU?”. It can be used to “check-in” at specific locations indicating the “reason” for attending these locations, to keep track of the different places where the user has been, declare the current location as his / her workplace, as well as to connect to their network at the Open University, in terms of the people they share activities with. The video below explains the principle of the application better than I can do with text. The application is now being tested and is made available for download (see QR code below – without guaranty that it will actually work) on data.open.ac.uk. Fouad is going to demonstrate it next week at the Extended Semantic Web Conference next week (see the abstract of the demonstration), and (perhaps more importantly) the sources of this first release are available in our code base. OpenLearn is a website giving free access to Open University course material. We especially look at the “LearningSpace” where hundreds of HTML documents, called OpenLearn Units, are made available. These units represent very valuable resources for students as they provide entry points into specific topics, useful in particular in deciding whether or not to enroll in a course on this topic. A lot of these units relate directly to specific courses as their content is obtained from the corresponding course material. Being able to query and use such metadata in connection with other sources of information can be very useful in applications supporting students in the discovery of learning resources, as demonstrated by the OpenLearn Linked Data application developed by Fouad Zablith. Representing an OpenLearn unit is realised through a specific class called OpenLearnUnit, which is a subclass of foaf:Document. Most of the common fields, such as title, subject and description of the unit are represented through common Dublin Core properties. A specific property relatesToCourse is used to relate a unit to the corresponding course in the Course Description dataset. We also use the Creative Commons Rights Expression vocabulary to express the license attached to the content of the unit (mostly Creative Commons Attribution – NonCommercial-ShareAlike 2.0 Licence) and the Nice Tag Ontology to connect units to the keywords they have been tagged with. While all this information is already available in structured form from the OpenLearn websites (through XML descriptions and RSS feeds), having it in directly accessible, Web addressable and queryable makes it easier to create new interfaces, new links and new processess that facilitates the use of this information for resource discovery. Some elements are still being investigated, regarding in particular the complex connection that might exist between an OpenLearn unit and the corresponding course material as described in the library catalogue. One of the biggest worry we had at the beginning of LUCERO was that we were promising quite a lot: we were not only going to establish the processes to expose public university data as linked data, but also to demonstrate the benefit of it through applications. Originally, we naively thought that we were going to build two demonstrators, providing obvious and complete illustrations of the ways in which linked data could support students and researchers in better accessing information from the university, and better exploit it. We quickly discovered that this “killer app” approach wasn’t going to work, as the benefits of linked data appear to be a lot more in the many “day-to-day” use cases, rather than in large, “clever” application projects. In other words, as clearly shown in both Liam’s post and Stuart’s post, data.open.ac.uk is quickly becoming an essential resource, a piece of the information infrastructure, that benefits use cases, scenarios and applications of all sorts and scales. That’s when we thought of organising a linked data application competition in KMi. KMi is full of very smart people, researchers and PhD students with the skills, knowledge and energy to build this sort of apps: lightweight, web or mobile applications to demonstrate one specific aspect and one specific use of the Open University’s linked data. I’m not going to give all the details of the way the competition was organised. We received four incredibly interesting applications (the promise of winning an iPad might have helped). This four applications are now featured on the brand new Data.open.ac.uk Application Page together with other applications currently being developed. So, congratulations to our winners! The choice was really difficult (and you might not agree with it), as the applications described below are all great examples of the many things that can be achieved through opening up and linking university data. OpenLearn Linked Data makes use of data from data.open.ac.uk to suggest courses, podcasts and other OpenLearn units that relate to an OpenLearn Unit. The application takes the form of a bookmarklet that, when triggered while browsing the webpage of an OpenLearn unit, will add to the page small windows with links to the relevant course in Study at the OU, to podcasts from the OU podcast repositories and units from OpenLearn that share a common tag. The great thing about this application is that it addresses scenarios directly relevant to students, prospective students and users of OpenLearn in general. It very naturally exploits the way linked data removes the boundaries that exist between different systems within the Open University, without having to change or integrate these systems. The OU Expert Search system (accessible inside the OU network only) allows users to find academics at the Open University who are experts in a given domain, providing a ranked list of experts based in particular on their research publications. It uses information about publications in ORO and computes complex measures to provide a ranking of the people who are most likely to be experts in the given domain. It also integrates data obtained from the staff directory of the Open University to provide contact details for the people in the system. Here as well the strong point of the application is its apparent simplicity. It is very easy to use and has been applied already for example to find Open University experts on Volcanoes (see Stuart’s blog post). Expert search is a complex task, and OU Expert Search, through the use of linked data, makes it look rather simple. OUExperts is a mobile (android) application to find Open Univeristy experts in a given domain, and connect to their social network. Similarly to the OU Expert Search application, it relies on information related to the scientific publications of OU researchers, as available in ORO. It also finds synonyms of the given keywords, and tries to connect to the pages of the listed researchers. The interesting aspect of OUExperts, apart from being a mobile application, is the clever attempt to connect to social networking website, so that it is not only possible to find an expert, but also to connect to them on Facebook or LinkedIn. Buddy Study suggests potential contacts and Open University courses to follow for students, based on the analysis of the topics in the user’s Facebook page. The application attempts to extract from the user’s Facebook page prominent topics, which are then matched to the interests of other people, and to the topics covered by courses at the Open University. In this case, it is the social aspect of a user’s presence online which is used to create connections into the data from the Open University, creating easily accessible entry points to the data. One of the reasons that I became interested in Linked Data was not the opportunities it gave external developers to do cool stuff with OU data; it was the opportunities it gave us at the OU to do stuff with our own data! It’s not only difficult things that I wanted us to be able to do, it was the stuff that should be really easy to do (but wasn’t) that I wanted to be made possible (actually I mean ‘cheap’, ‘easy’ and ‘quick’ rather than possible). One of the massive successes of the LUCERO project is that we have been able to free so much of this data from various silos and link it together (let alone link it to non-OU data as per Mathieu’s previous RED example) so that we can ask interesting and (more importantly) useful questions against it. A very practical example of this happened regarding the sad news about the Tsunami in Japan. The OU has some of the world’s experts on earthquakes but no currently-live experts database. Similarly the OU has a massive collection of podcasts on iTunesU – surely there must be some content that we can highlight that will help inform the public debate and discussion around recent events? Well of course we do but it turns out that some of our systems make it very easy to find this stuff and it’s be a pain having to visit and query numerous separate locations. Fortunately a quick call to @fzablith and some cool entries to the OU linked data dev competition proved an enormous help. Fouad quickly rustled up a SPARQL query which returned all of the OU podcasts related to earthquakes and another returning relevant OpenLearn units (of course I already had the same query in my head, I just wanted to double-check that he would do the same thing ) whilst the Expert Search (OU network only) returned a great list of all our academics who had peer-reviewed work published on the topic. All very helpful and very quick! It’s exactly this kind of understanding of what we produce as a university and the greater opportunities it gives us to actually make use of it for a variety of purposes (course production, media relations, reuse in external environments) that makes me excited about what we’ve already achieved and what more we can achieve over the coming years. In my own particular area of responsibility (web publishing at the OU / social web) I’m really looking forward to making our web CMS (Drupal) contribute to the data we have on data.open.ac.uk and also consume the data. Whether that’s building a new experts guide which builds on the OU people profile system and pulls in relevant data from data.open.ac.uk and external data sources, or making it easy (a few clicks of a mouse easy) for site builders with particular audiences (subject areas specific / industry specific) to include information on OU courses, podcasts, research OERs, YouTube videos etc. Watch this space! This query lists all the Open University courses that can currently be registered to from Nigeria. This query find any video podcast and OpenLearn units which descriptions contain the term “earthquake”. Subject headings used to describe a specific podcast (@psychemedia). Subject headings used to describe all podcasts (@ppetej). Prices (ordered) with currency of OU level 1 courses in Arts and Humanities as available in France. Video podcasts related to postgraduate courses in computing. Spanish courses available in Germany. People with more than one family name in ORO. RED is one of the projects from the Open University’s Faculty of Arts working with LUCERO, as an early example on how linked data can be applied to research in humanities, and in general. And it is really a very good example! We have been working on an initial method to extract the content of the RED database into RDF, combining several well known vocabularies (see figure below). While we are still at an early stage in the whole process, this has given us a great insight into the challenges and potentials for linked data in such a domain. Data cleaning is clearly one of our biggest issues. The RED database is mostly based on contributions from various people, from researchers in humanities connected to the project, to interested individuals. As a result, many entities are duplicated, misspelled, or mistakenly aggregated. A lot of these problems can be addressed automatically through filters, but the major part has to be addressed by the RED team, who are currently involved in a cleaning, normalisation and restructuration process. Unsurprisingly, where the linked data approach really creates novelty here is in the links. We have published a “preview” of the dataset in data.open.ac.uk, we initial sets of links for people and places, to their (supposed) equivalent in DBPedia. For example, Virginia Woolf, who is both an author and a reader in the RED database, is represented as http://data.open.ac.uk/page/red/person/woolf-virginia, which is linked to the corresponding DBPedia http://dbpedia.org/page/Virginia_Woolf. This might not look like much in principle, but in reality, it opens up to new ways to look at the data, that couldn’t be anticipated even by the researchers involved in modelling it. I gave a quick talk at a workshop organised two weeks ago by the RED team, to an audience of researchers and lecturers in humanities (see picture above). Showing the benefit of linked data to such an audience is clearly not the most trivial task. I therefore developed a small demonstrator that presents in one page the information about a given person from the RED database (here, Virginia Woolf), together with some information from DBPedia (abstract, categories, and influences). Now, where it becomes interesting, is that the information from DBPedia can be used to filter and browse the information in the RED Database. What this demonstration can do is, through clicking on the corresponding categories, tell you what other people in RED are, according to DPPedia, People from Kensington, People With Bipolar Disorder, Bisexual Writers, Writers Who Committed Suicide, etc. Looking at this, through one simple set of links to one dataset, we can already see emerge a brand new research questions and a new set of research practices, together with the data to start exploring them. We can only be overwhelmed thinking about what will happen when the approach is generalised to more links, more datasets, and more research projects. 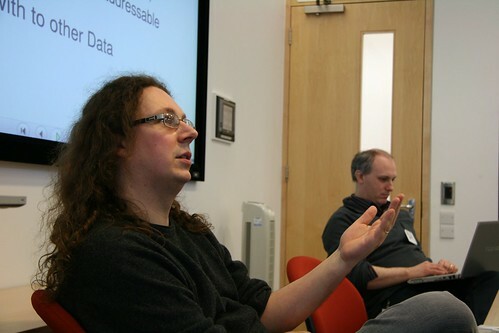 This is a guest post by Liam Green-Hughes, a developer at The Open University, relating his experience with Linked Data to date, and his initial use of Linked Data from http://data.open.ac.uk. Over the last few months I have been on a bit of a journey in the world of Linked Data. It has had highs and lows, frustrations and triumphs, but in the end it was worth it. When you first enter the world of the “Linked Data movement” the terminology can be baffling it is a world of “triples”, “RDF”, “SPARQL” and lots of other terms that will come as news to many developers. Yet when you see past all that it turns out it is a genuinely useful concept to developers like me. Over the past few weeks I have been experimenting with the Open University’s new Linked Data service in a number of scenarios and have now used it in a production environment. Without a doubt the learning curve involved in being able to use Linked Data is significant. Some of this may be down to the fact that it is relatively early days for such technology so it will take a while to settle down. A lot of the learning curve to do with learning the SPARQL language. It was designed to be a SQL-like way to obtain data from endpoints. I have heard it described as “more powerful” than SQL but I am not sure that comparison serves much purpose, the two languages have similarities but exist to do different things. SPARQL often feels more difficult to understand, less obvious what is going on that SQL. Maybe it needs some more work as a language in order to open it up to more developers. Once you have worked out a few example queries though you have enough to get going and at least. A breakthrough on my journey to be able to use Linked Data was the realisation that I should just stop worrying about the terminology and get on with using the data. When you query a SPARQL endpoint what you actually get back is XML or JSON. For a developer this is wonderful as many programming languages include tools to parse these formats. Sure there are libraries available that will give you richer functionality, it just depends on what you want to do. Parsing incoming results is easy enough. When I realised this I wrote a blog post “An approach to consuming Linked Data with PHP ” which provided me with a basis to do other things. There are many things that are complicated about Linked Data, but actually sending and receiving information to an endpoint turned out not to be one of them. In fact it turned out to be easier than using a SOAP service! Many people use Linked Data services to construct reports or create mashups but I started experimenting with another theme. Linked Data is part of an idea to move to a “web of data” from a “web of documents”.. For me this fitted very well with another big change happening in the web; the move away from just looking at web pages on a desktop computer to consuming data on lots of other devices like mobiles, smart televisions and tablets. Each of these classes of devices have very different user interface requirements, often with dedicated applications. The underlying data driving these applications can be the same though so my experiments so far have centred around the idea of bringing OU data into new contexts such as mobiles and to the social web. In the OU’s Linked Data store we are lucky enough to have access to all sorts of data including podcast information. With an idea in my head about using Linked Data to reach devices I looked at the new JQuery Mobile library which is designed to make creating mobile web applications easier. So the actual application still runs on a server, but when you view the output of the application on a mobile web browser (or in a thin app wrapper) it looks very much like a mobile application. The advantage of this approach is that you end up with something that works across a variety of mobile devices, for a fraction of the effort it would take to create apps for each mobile operating system. I created the app with navigation menus to drill down to the podcast you require. This was quite easy to do as I could create SPARQL queries on the fly using menu selections to filter the information. In fact I could get a prototype together in only a few hours. It would need more work to be production useful, but being able to use SPARQL on the fly was very useful. Encouraged by this success I felt it was time to put our Linked Data store to good use with a production requirement. We have an application inside Facebook called Course Profiles which enables students to advertise what course they are studying with the OU on their profile page. For a while keeping the course list up to date has been a bit tricky. It used to be done by either manually adding entries or taking input from a file containing all of the course codes. Linked Data came in useful in this case as we can use it to obtain the live course codes and load this directly into the database though the application. The data was quite easy to parse and then it is possible to work out which courses are missing and add them. This will make it much easier to keep information up to date and I know that it is coming from a publicly documented source, making it easier for me as a developer to work with. My third experiment was to try to hook up the Linked Data service to Google’s App Inventor for Android. Connecting these two cutting edge developments seemed like a good opportunity to me, having all of this data readily available means that all sort of new apps will be possible. App Inventor isn’t just a great teaching tool for programming, it is also a great prototyping tool. Creating an app this way might not lead to such a polished result as coding by hand but does mean that you can quickly experiment with building different kinds of apps quickly and with limited effort needed. App Inventor is a little limited in what it can cope with in web data terms, so I wrote a script to enable conversion of the results from an endpoint into a format that App Inventor could deal with. Full details are in my post: Using Linked Data in App Inventor for Android with the help of a bridging script. So why not just use an API instead of Linked Data? Many developers are used to using APIs and many sites, e.g. Twitter and Facebook support an API to extend their functionality. I don’t think Linked Data is necessarily better than an API, but it might offer a better solution in some circumstances. The data you can return is very flexible, you don’t need to look up the syntax of a new API call every time you want new information. Also if two sites support a Linked Data endpoint the way you work with them will be broadly the same, you don’t have to worry about things like downloading any extra software libraries to be able to access the API. It would be wrong to ignore the issues around the usage of Linked Data, the learning curve involved and the difficulties in making those first steps. My own journey with it has been difficult and at first I wasn’t persuaded. Now having experimented with it and forced myself though a bit of the learning curve it is delivering on its potential and I am encouraged to continue learning about this technology. It is still early days for the Linked Data movement so it is a great time for developers to get involved and help this idea grow and work with others to sort out difficulties along the way. The prize is ready access to lots of information about the world around us. One of the first data sets to be made available on http://data.open.ac.uk is the contents of ORO (Open Research Online), the Open University’s repository of research publications and other research outputs. The software behind ORO is EPrints, open source software developed at the School of Electronics and Computer Science and is used widely for similar repositories across UK Higher Education (and beyond). We had initially expected to extract data from ORO in an XML format (possibly RSS) and transform into RDF. However, Chris Gutteridge, the lead developer for the EPrints, added an RDF export option to version 3.2.1 of EPrints, and since we could get this installed on a test server we decided we would make use of this native RDF support. We did make a few small changes to the data before we published it, mainly to replace some of the URIs assigned by EPrints with data.open.ac.uk URIs as noted the blog post ‘First version of data.open.ac.uk‘. In some cases the author uses different versions of their name in different publications. Good practice for ORO is to use the name as printed on the publication, which can result in different versions of the same name – for example in most papers, Maria Velsco-Garcia’s name is spelt with a single ’s’ in Velasco, but in one paper, it is spelt Velassco with a double ’s’. There were a couple of examples where the publisher had incorrect data in their systems, which had been brought through into ORO. One particular example split a single author with several parts to their name into two separate authors. Having identified the records effected, the next challenge was correcting them – firstly investigation into each error (this could be challenging – especially where name changes had occurred it was sometimes difficult to know if this was the same person or not), secondly the question of where these are corrected. In this case we were given edit access to ORO so we could make the corrections directly, but the question does arise – what happens if you can’t get the errors corrected in the source data set? I suspect that this ‘magnification’ of errors will lead to some debate over the urgency of fixing errors. While for http://data.open.ac.uk fixing the data errors becomes important (because they are very obvious), it may be that for the contributing dataset (perhaps especially large datasets of heterogeneous data such as bibliographic data) fixing these errors is of lower priority. On the upside, using the data on data.open.ac.uk we can start to run queries that will help us clean the data – for example, you can find people with more than 1 family name in ORO.